We wish you and your family a wonderful holiday season! 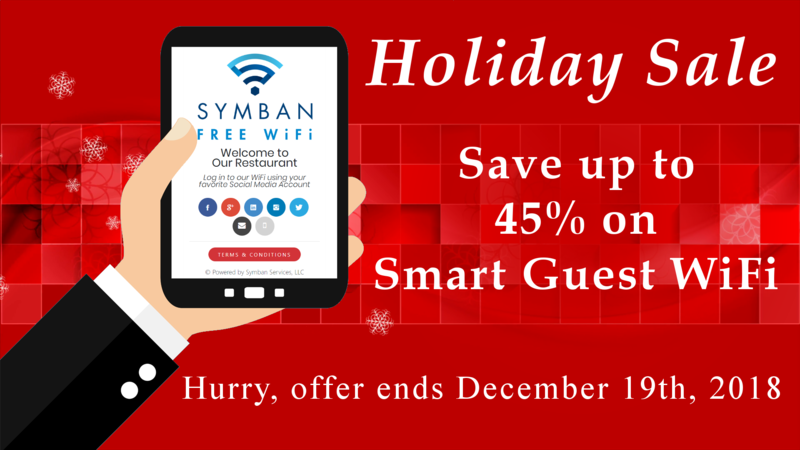 In honor of the holidays, we at Symban Services are happy to announce special holiday pricing for our Smart Guest WiFi service. Paying too much for your Guest WiFi service? Would you like better support? It’s plug and play to automatically maintain contact with your visitors, remind them to come back, host their birthday party with you, and gather their information so you can know them better. Setup is 30% off and Smart WiFi is 45% off for the life of your contract! But hurry, the special pricing is only valid until December 19th, 2018! Book a Call with us and we’ll call you or call us at 305-901-2310 x.137 to discuss your requirements.